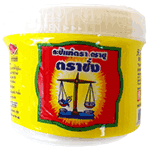 Premium Quality Shrimp Paste, Tra Chang brand Tra Chang fish sauce is the best fish sauce we've ever tasted, and now we've imported the highest quality shrimp paste from Tra Chang. Made using the finest shrimp, packed in the most hygienic conditions. Our Tra Chang shrimp paste is extremely fresh, as it was just packed and shipped to us. This is the best shrimp paste you will ever taste. A key ingredient in authentic Thai recipes listed below, shrimp paste is made from fresh shrimp and salt. A strong-smelling and very important element of all kinds of Thai curry paste. You'll love it in gaeng hanglay. Packed in convenient plastic tub with tightly sealed lid. Ingredients: shrimp 80%, salt 20%. Product of Thailand.